Happy St. Patrick’s Day! 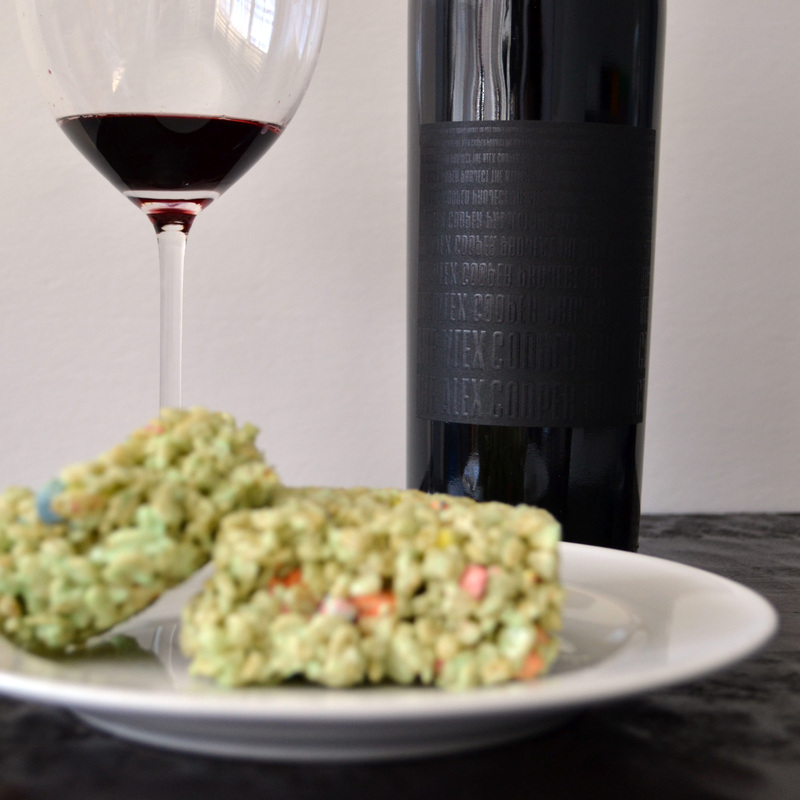 In honor of the holiday, we whipped up this delicious St. Patrick’s Day treat and tasted it with four different wines. The result – you can make your children (or friends… or your inner child) a delicious St. Patrick’s Day treat that goes well with your evening glass of wine. Cheers to that! We took a page out of Wine Folly’s book, and started our pairings based on their ‘Cereal and Wine Pairing Throw Down‘. These Rice Krispie Treats have Lucky Charms marshmallows mixed in, so we went with Madeline’s recommendation of Zinfandel, but unfortunately did not have a sweet Riesling on hand. These Rice Krispie Treats had a splash vanilla extract, so we threw in a Chardonnay (which turned into two) to pair the vanilla flavors extracted from oak. The first wine taught us that wine does work with Rice Krispie treats, but we needed a Chardonnay with much more oak to compliment the round mouth feel of the creamy marshmallow. This Chardonnay is more similar to a Chablis, in that it’s bright, mineral driven, and made in stainless steel. A beautiful wine, and a delicious dessert, but these two are not a match made in heaven. Which led us to pop open one more Chardonnay…. 32 Winds 2011 Chardonnay, Lucky Well U.V. Jackpot. This Chardonnay is aged for 9 months in French oak, and the round supple mouthfeel paired perfectly with the Rice Krispie Treats. The vanilla from the oak brought out the hint of vanilla in the treats, and the two made for a harmonious flavor that lingered in the mouth. This was a killer pairing. While not as melodious as the Chardonnay, if you prefer red wines, this combo still makes for a fun pairing. The silky mouthfeel pairs well with the creamy marshmallow, and the ripe, bright fruit flavors stand up well to the sweet cereal notes. Again this wine was aged in French oak (though it was old French oak) so the hints of vanilla in both are complimentary. Thanks for the fun recommendation, Madeline! The 32 Winds Chardonnay was good, really good, but for me, it does not get much better than Rice Krispie Treats and Ratafia. Ratafia is made from grape must ‘fortified’ with Champagne alcohol. Champagne Dumangin is then aged for seven years in a combination of vessels including used Crozes-Hermitage barrels. The result is a semi-sweet aperitif that is amazing on its own, and compliments these Rice Krispie Treats incredibly well. Cheers to fun pairings, what is your go to St. Patrick’s Day Wine?